Part 1 of my John Walton’s “Greatest Hits” series can be read here. Once again, what is being accomplished on Day 3 is the establishment of a function. Nothing of material structure is created, for ANE cultures were not concerned with such things. Just as God created the bases for time and weather on Days 1 & 2, God creates the basis for vegetation on Day 3. To ANE civilizations, time, weather, and vegetation were of prime importance to agricultural industry and intimately connected to each other. Like Genesis 1, the Babylonian creation epic, Enuma Elish, depicts their god Marduk establishing the functions of time, weather, and vegetation. Walton then makes the interesting point that, after Noah’s flood, God promises that the three major life-giving functions would never cease: “While the earth remains, seedtime and harvest [vegetation/agriculture], cold and heat, summer and winter [weather], day and night [time], shall not cease” (Gen 8:22 ESV). And that’s an excellent promise, for the importance of these three functions is just as important today as it was in millennia past. In non-Hebrew cultures, the governance of time, weather, and agriculture—the “foundations of the cosmos”—were attributed to a pantheon of gods. The destinies of men were also tied to the whims of the gods. One of the most important aspects of the Genesis creation account is the proclamation that God (Elohim) ruled the cosmos. In effect, Genesis did away with the common misconception that deities were behind the forces of nature, and that Elohim was in full control. 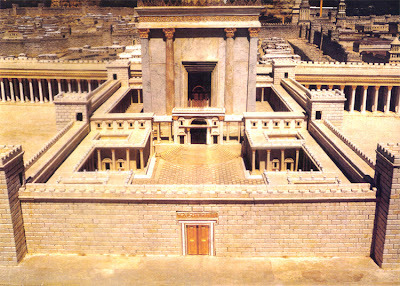 It might interest you that ANE temples were commonly dedicated over a period of SEVEN DAYS! While Days 1-3 were concerned with the declaration, or establishment, of functions and the “fabric of the cosmos,” Days 4-6 were concerned with the installation, or establishment, of functionaries. Thus, the sun and moon, animals, and mankind were “created” to serve in the capacities to which they were designed, assigned, and destined. Like other ANE gods, Elohim is said to “rest” on Day 7, connoting “stability” and “equilibrium.” All is functional, all is good (except for man’s loneliness, which represents a “non-function”). 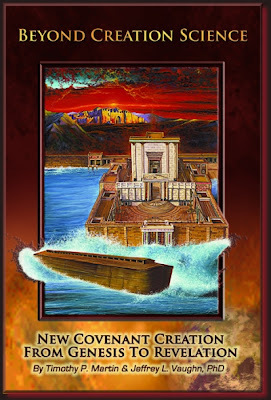 Genesis 1, then, is indeed a “temple text,” just like the Ugaritic Baal Cycle and the Enuma Elish. Genesis 1, read at face value (dare I say “literally”), is NOT about God making things. God inspired the author of Genesis to write about God establishing function and purpose, creating order from chaos, declaring other “gods” to be persona non grata, and proclaiming that the cosmos is God’s, with heaven serving as His throne and earth serving as His footstool! Amen. Whales and Bovines Genetically Related?!?! Inconceivable! 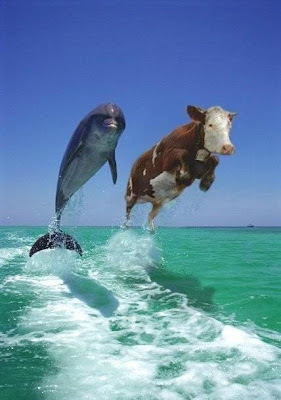 I’m not sure whether this picture is genuine, but I think it could settle forever the entire whale/cow common descent debate. “Beyond Creation Science” Is Here! What’s unique about this particular book is how it ties the creation debate with the “end times” debate. 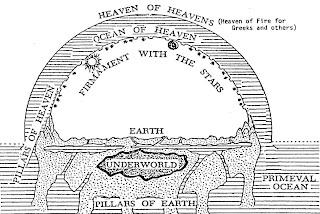 Although the authors and I don’t agree fully on the origins question (both are Old-Earth Creationists, whereas I’m an Evolutionary Creationist), or on the correct interpretation of the early chapters of Genesis, we both agree that OECs (or even ECs/TEs for that matter) who still hold to a futurist eschatology have failed to examine the major (theo)logical disparity between their view of beginnings and their view of the end. It is the addressing of this disparity that proves to be the strength of Beyond Creation Science. If you, as a reader of this blog, have already made that agonizing paradigm shift from YEC to OEC or TE/EC, yet still look to a future “new heavens and new earth,” then I highly recommend this book to you, along with Brian Martin’s Behind the Veil of Moses, the second edition of which I am currently editing. Contrary to a superficial reading of Genesis 1:3-5, Walton argues that this passage does not describe the creation of physical light per se. Rather, God created the basis of time—the first step to bringing order to the cosmos. After speaking light into existence, God “called” light by its name, which was a common method in the ancient Near East (ANE) of assigning function or purpose. Also of note is the author’s use of metonymy, a figure of speech in which a particular word or phrase is substituted for another because of their intimate association (e.g., Washington = US Government). Thus, the first mention of “light” in v. 3 should be equated with the “period of light” God called “day” in v. 5. Just as the creation of light served the function of time, the creation of the firmament served the function of weather regulation—God’s second step in bringing order to chaos. On the American Scientific Association’s (ASA) Email Discussion Group, Jon Tandy posted the following illustration of how God need not direct the process of evolution, much as He need not direct the process of photosynthesis, gravitational attraction, etc. As Christians, we acknowledge that God sustains the universe by His power; however, to claim that God directs the actions of every particle in the universe is to ascribe a role to God that He (according to the Bible) never ascribes to Himself. Moreover, could there be instances in which God, through His foreknowledge, chooses more often that not to infuse an historical event with theological meaning rather that physically manipulate the course of that event? Another favorite illustration is the weather. While it may not be purely random (certain known processes are involved, such as temperature, pressure, humidity, etc. ), actual weather events can be seen to encompass a good deal of randomness when we look at the detail level, even with modern instruments and observations. Chaos theory is now invoked to describe these random processes. Is God involved in the weather? Does God jiggle every particle of dust through the atmosphere to create a rain drop to be flung to the ground at His will, or does move every electron in a spark of lightning? Common sense tells me no, these are natural processes that God doesn’t need to directly manipulate. Yet, does God occasionally bring hail storms as judgment against sin? Does he bring famine and drought, as predicted by the prophets, to humble his people and bring them to repentance? Is he able to bring the rain again after the people repent, due to the ministry of an Elijah? So from this, I guess the biologist could look at the scientific evidence of evolution and observe many features resembling randomness, but the theologian looking at the same process could claim directedness and purposefulness in God’s action from a Theistic Evolutionary perspective. Is this a case, somewhat like in Special Relativity, where two different observers can both be correct from their own frame of reference, even though their observations differ from one another? This is a valid question for Theistic Evolutionists—for those who defend “undirected” evolution as the mechanism of evolution, do you also hold the idea of purposefulness at a higher level? Is there any Theistic Evolutionist who doesn’t confess directedness and purposefulness behind evolution, when viewing it above the level of scientific and biological fact? Isn’t this the very meaning of the term “Theistic” Evolution? Evolution is the mechanism of the biological level, theism is the mechanism of a higher order. I also like the illustration that has been given before, of the words “God is love” written on a blackboard. At one level, they are simply solid bits of chalk adhering to the board. At a lower level, they are not solid at all, but are mostly empty space consisting of random motions of electrons, protons and neutrons. At a higher level, it can be seen that there is a non-random design and intentionality in the pattern of chalk, provided one recognizes the language of English in which they are written. And at a yet higher level of cognitive and emotional awareness, the words “God is love” mean something more than the pattern of the letters reveals, and on the highest level is God’s love itself which incapable of being fully understood. Which one of these levels of perception is the “true” one—the random motion of electrons, the designed pattern of bits of chalk created by human hand, or the divine reality of God’s love that transcends mortal ability to comprehend? They are all true from different frames of reference. I’ve been “tagged” by ElShaddai Edwards at He Is Sufficient. A teaching from the Bible that you struggle with or don’t get? The tension between man’s freedom and God’s sovereignty. Odd struggle for me, especially as a Calvinist. Coolest name in the Bible? There were only two named angels: Michael and Gabriel. Guess which one I think is coolest? I will now tag: Virgil Vaduva (Planet Preterist), Gordon J. Glover (Beyond the Firmament), and Tim Martin (Beyond Creation Science). Fortunately, these three options aren’t the only ones available to us. The first option, constructing an alternative science, is typically used when one cannot deal with the face value of the text. The YEC might say, “But I am taking the text at face value! The Bible clearly says that God created the universe in six days!” Walton, however, would respond that the Hebrews would have read the very same literature very differently. What a modern, 21st-century reader would consider a “face value,” or “literal,” interpretation of the text does not necessarily equate with what an inhabitant of the ancient Near East (ANE) would consider a “face value” interpretation. In regard to the second option, considering the text purely theological, Walton asks whether Israel (or any other ANE culture for that matter) distinguished between “science” and “theology.” It is only because our understanding of the material world has progressed far beyond that of ANE cultures are we able to contemplate the difference between the physical and the metaphysical. Four millennia ago, that difference did not exist. As tempting as it is to go for the third option, Walton urges us not to read the opening chapters of Genesis as mere literary expression, but rather as a literal (not literary) expression of Hebrew cosmology. Ironically, the YEC and ANE interpretations of Genesis 1 use the same methodology while producing two completely different conclusions as a result of their differing worldviews. Does Genesis Concern Making Things? The overarching theme of Genesis 1 is that of God creating order out of disorder. “Order” is thought of in terms of “functionality,” not structure. In other words, Genesis 1 is not speaking of God creating the universe ex nihilo (out of nothing), but rather of God assigning function to the cosmos and its component parts. The “existence” of an object is dependent upon whether function (or a name) has been assigned to it, not the fact that it takes up space. In ancient Egyptian thought, for example, things were considered “non-existent” if it wasn’t assigned a function. If these points are true, then the entire YEC/OEC debate vanishes in a cloud of clarity! If indeed Genesis 1 is more concerned with function than structure, there is no need to argue over the length of the span of time during which material things were created, nor is there a need to argue which material objects were created on which day of the creation week. Walton asserts that, “If the Israelites did not have a view of the cosmos like the one that was current in the rest of the ancient Near East, it would only be because God had revealed a different reality that transcended their old-world science. If God did not reveal realities such as a spherical earth or the rotation [on its axis] and revolution of the earth [around the sun], the Israelites would have had no way to arrive at these conclusions.” Walton is absolutely correct. In fact, if a careful study of the Old Testament is conducted, one will find unassailable evidence that the Hebrew understanding of the physical cosmos mirrored other surrounding cultures’ concept of their shared world. Sure, one might find a verse or two that appears to support a spherical earth, but when a list is compared side-by-side with scriptural evidence that the ancients believed the earth to be flat, well … flat-earthers will likely be overjoyed. The Hebrew word for “created” (בָּרָא, bara’) is used about 50 times in the Old Testament and has, as its objects, people groups (Ps 102:19; Ezek 21:35), Jerusalem (Isa 65:18), physical phenomena, abstractions, people (Gen 5:2)—all things which existed (or experienced, in the case of physical pehonomena) previously to their material “creation.” Contrary to popular belief, the word is “never used in context[s] where materials are mentioned”! Walton argues that, in these instances, God is establishing function and purpose. Thus, in Genesis 1, God is establishing order in the universe. Genesis 1:2 states the cosmos was “formless and empty,” that is, not lacking material structure, but rather order and purpose.